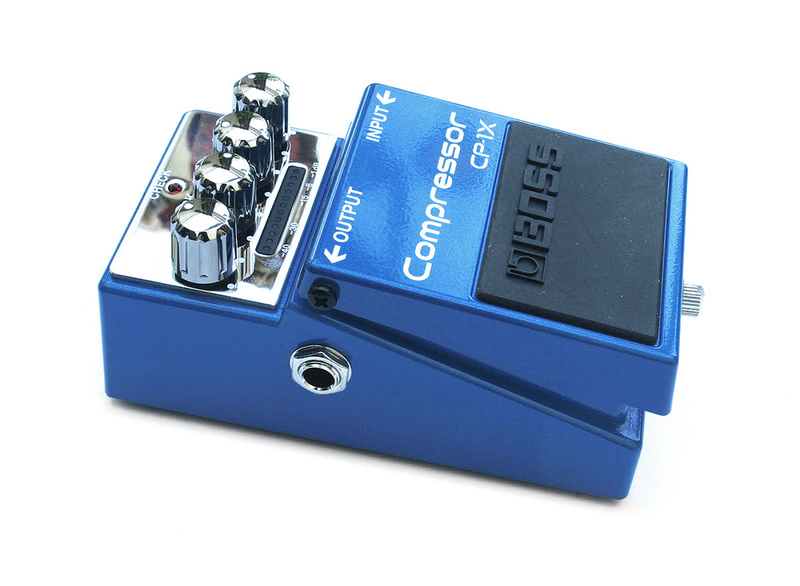 Despite appearances, the new CP-1X is no typical guitar compressor pedal. It employs Boss’s proprietary Multi-Dimensional Processing (MDP) technology, which analyses various aspects of the incoming signal in real time and then responds by optimising the digital processing for the source. Various playing characteristics, such as note register, are analysed, whether you’re playing single notes or chords. And despite the CP-1X’s internal complexity (it’s actually a multiband compressor), it has a straightforward interface with four knobs, labelled Level, Attack, Ratio and Compression, though adjusting one control actually changes multiple parameters behind the scenes. Inside, the MDP technology identifies the overtones and then only compresses that element of the signal — the fundamental is preserved, which means no wet/dry control is needed to keep the sound ‘intact’. The 16-LED gain-reduction meter is a neat addition to the usual ‘flying blind’ compressor pedal format. Internally, the 9V power supply is ramped up to 18V to provide extra headroom. PSU operation is recommended, as battery life is limited to around three hours. The Boss CP-1X certainly delivers on a musical level. Operation is simple, but having separate control over both ratio and attack rather than just the ‘more or less’ knob of many guitar pedals makes a big difference. The variable attack time, for instance, makes it possible to emphasise note attacks for country-style picking. The main thing you notice about this pedal, though, is that the amount of compression you can pile on without the sound becoming unnatural is extraordinary. At higher settings, you can get into super-smooth pedal-steel-like sustain, while for blues or rock playing you can just add a little sustain without detracting from the natural tone of the instrument. Placed before an amp or pedal that’s just on the edge of break-up, you can get some lovely bluesy sounds. The CP-1X also works well on amplified acoustic guitars, adding life and density, again without compromising the core tone of the instrument. I plugged in a number of different compressor pedals for comparison, including TC’s digital Hyper Gravity multiband pedal, and in all cases the Boss CP-1X preserved more of the original brightness and overall balance of tone. 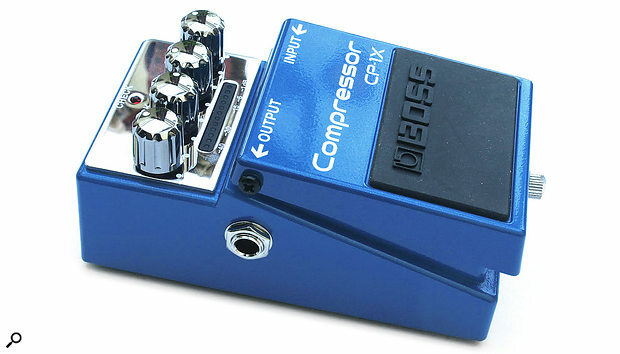 Even at higher compression settings, the Boss CP-1X produced less of that ‘ground shifting under your feet’ effect that so many pedals seem to introduce, where you end up being very aware of the gain coming up as a guitar note decays. The noise level is uncannily low too, and while you can provoke an obvious heavy-compression squash by maxing out the Ratio and Compression knobs, the result is still musically useful. At more realistic settings it’s almost like having no compressor at all — your guitar just seems to sustain better. Boss deserve to do very well with this one!